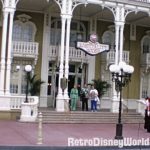 When I began acquiring discarded home movie films from people’s visits to Walt Disney World in the 1970’s and 80’s I developed a list of “holy grail” things I hoped to see captured on film. 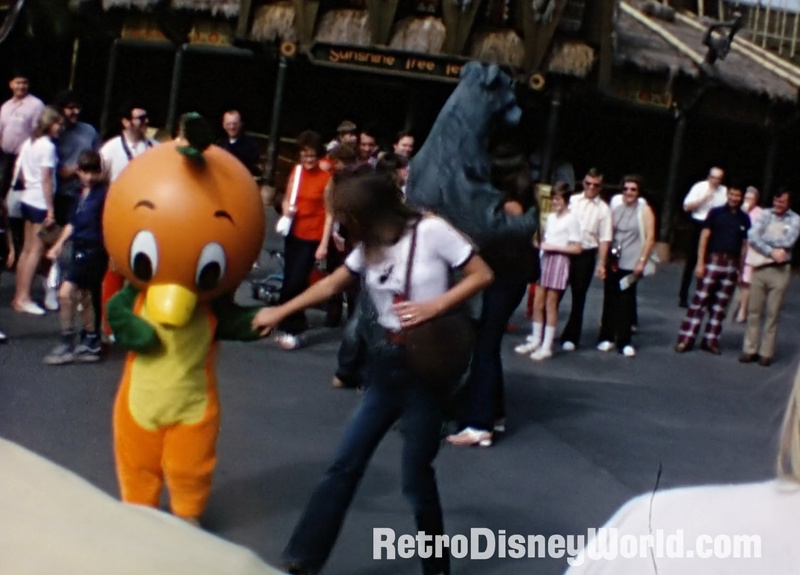 The Florida Orange Bird was a character developed exclusively for WDW by Disney Imagineers on behalf of the Florida Citrus Growers (Adventureland’s original sponsor). Not long after park opening the character began doing meet and greet appearances in Adventureland. These continued throughout the 1970’s and ended with the Citrus Growers sponsorship deal in 1986. 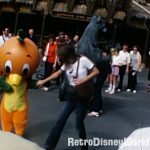 While one or two very poor, brief, long distance clips of the Florida Orange Bird have circulated on YouTube, the OB never appeared in the many WDW TV specials or souvenir films. So high on the list of “holy grail” items was finding good footage of an Orange Bird meet and greet. When I purchased the Magic Kingdom October 1974 film you are about to see I was prepared to have my hopes dashed as I have with dozens of other films. This one, however, was different. Our film opens with a homemade title screen shot on the door of the family’s garage before they arrive at the Transportation and Ticket Center appropriately clad in vacation wear of the era. 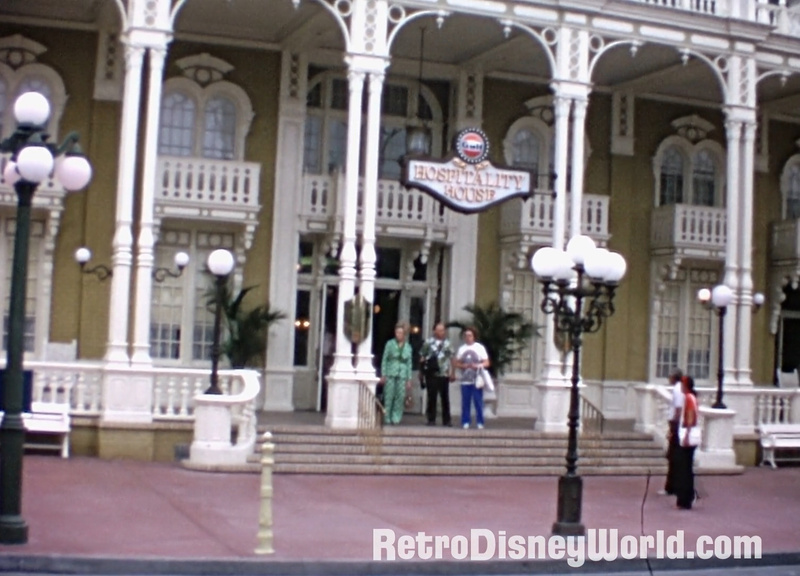 A nice shot of the Magic Kingdom’s empty centrally located turnstiles (where we go through security now) are seen before we stop into Town Square and Main Street, USA catching a look at the Hospitality House (Tony’s Town Square Restaurant) and then the hub and Crystal Palace restaurant from a distance. As we moved into Adventureland and boarded the Jungle Cruise I was excited. Maybe we will finally strike Orange Bird gold! As our family steps off the Jungle Cruise they walk by Adventureland Verandah and the Swiss Family Robinson Treehouse. We see a crowd off in the distance by the Enchanted Tiki Room and Sunshine Tree Terrace. Our family moves in closer to see what the commotion is all about. EUREKA! The Florida Orange Bird, King Louie and Baloo spend the next 30 seconds dancing and entertaining the guests in Adventureland. We see the Orange Bird sign an autograph book for some children before moving on to the Rivers of America. I will admit the first time these frames came into my view finder I got a little emotional. I had spent years searching for quality home movie footage of the Orange Bird. Now my mission was complete. It is worth noting that this is one of two variations of the Orange Bird character. This one had a solid plastic head. There is another version that had a fur/felt covered headpiece. We don’t have footage of that one — yet! 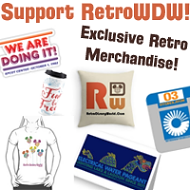 In our post-Orange Bird euphoria we sail by Tom Sawyer Island the Haunted Mansion and not much else, as the rest of Frontierland as we know it didn’t exist until Big Thunder Mountain was built in 1980 and Splash Mountain in 1992. You do get a good glimpse of how much the scenes along the river took prominence then vs. how they often fade in the background of those two mountains in modern times. We see the Big Bad Wolf and Three Little Pigs meeting outside Liberty Tree Tavern before our family AGAIN boards the riverboat. They must have liked the ride. They hop on the Skyway, glide to Tomorrowland, meet grumpy (because dwarfs are futuristic) and head back out to the hub to take in some more scenes of the castle before ending their visit with the daily parade. So thank you Matty & Ruth, Alex & Josephine for taking us along on your trip to Walt Disney World and fulfilling a dream decades later. Wow, I was there in 1972 and forgot how uncrowded it was back then, this movie is awesome. So great to see the old rides and shows. Wow!! Adorable! What a great find!